The Compabloc Free Flow condenser offers a range of benefits compared to shell-and-tube and graphite block condensers. 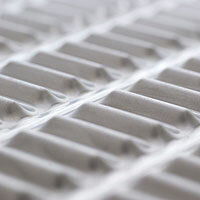 The core of a Compabloc Free Flow is a stack of corrugated heat-transfer plates made of stainless steel or other corrosion-resistant materials, laser welded alternately to form channels. The vapour and the cooling medium flow through alternate channels, causing the vapour to condense on the cold plates. The wide free flow channel gives Compabloc Free Flow a very low pressure drop, making it ideal for deep vacuum condensing duties. On the coolant side, baffles direct the cooling media back and forth through the channels to increase turbulence and thermal efficiency. The complete plate pack slides inside a steel frame bolted to pressure-retaining heads. Four removable panels contain the inlet and outlet connections and give easy access to all product-wetted surfaces. 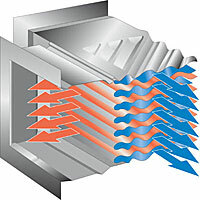 The corrugation on the plates causes high turbulence, resulting in substantially higher heat transfer efficiency compared to shell-and-tube or graphite bloc condensers. The overall heat transfer coefficient is two to four times greater, which means a Compabloc Free Flow only requires 25-50% of the heat transfer area. Installation costs are minimized thanks to the compact size, as are investment costs if you require exotic materials. High thermal efficiency also means a Compabloc Free Flow requires less cooling medium, or you may use a warmer, less costly, cooling medium. High turbulence also helps prevent scaling on the cooling water side and makes cleaning-in-place (CIP) procedures more efficient.